A collection of wacky, whimsical poems about books and all the treasures they contain. Laura Purdie Salas, the acclaimed author of Stampede!, is back with another collection of wild and weird, wacky and winsome poems about all the magic to be found on a single bookshelf. 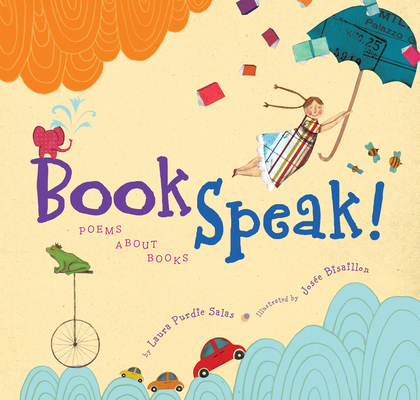 In BookSpeak!, each poem gives voice to a group that seldom gets a voice . . . the books themselves! Characters plead for sequels, book jackets strut their stuff, and we get a sneak peek at the raucous parties in the aisles when all the lights go out at the bookstore!Illustrator Josée Bisaillon’s mixture of collage, drawings, and digital montage presents page after page of richly colored spreads filled with action and charm. Together, Salas and Bisaillon deliver a unique collection brimming with ideas as much about spines and dust jackets as they are about adventure and imagination. Laura Purdie Salas is the author of several poetry and nonfiction books for children. She lives with her family in Minnesota, and you can find out more about her at www.laurasalas.com. Josée Bisaillon grew up in St-Hyacinthe, Québec, Canada. Rather than follow in her father's footsteps as a veterinary surgeon, she chose to cut animals from paper: they were colorful, low maintenance and always in fine health. Bisaillon has won many Applied Arts Illustration and LUX Illustration Awards in Québec, and was a finalist for the 2008 Governor General's Literary Awards in Canada.